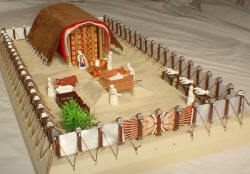 eBibleTeacher.com: Moses Bible Tabernacle 3D model, photo, resource and information site. The Bible text about the altar of Incense is Exodus 30:1-10. 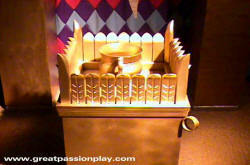 The altar of incense was made of gold covered acacia wood. 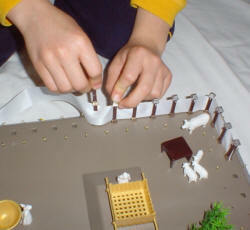 It was a cubit wide (18 inches) a cubit deep (18 inches) and 2 cubits tall (36 inches) with horns on the four corners. In this case, there were to be two rings, one on opposite corners at the top moulding for inserting rods to carry this piece of furniture. It would have been too heavy to transport to be made of solid gold. 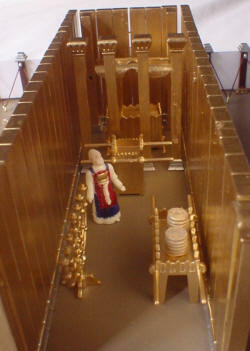 This altar was to be placed in front of the curtain separating the hold place and the most holy place in the tabernacle. On this altar incense was to be burned. This image by Brent Kington is based on the Bible text. Click to enlarge. I think that there should only be two rings at the top rather than 4 rings however. 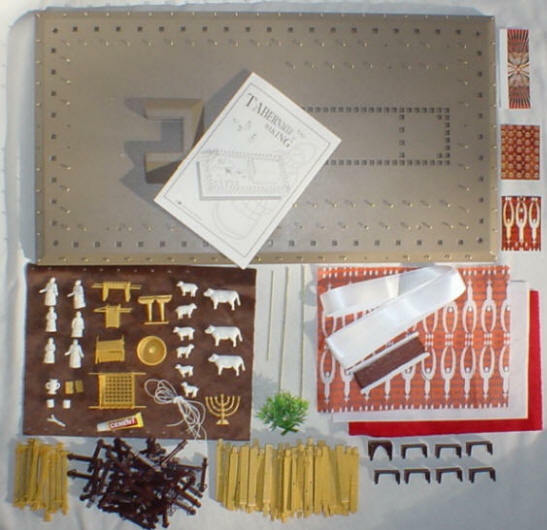 The image to the left is from the Eureka Springs THE GREAT PASSION PLAY full scale model and is NOT from the 3D online model but is shown for comparison.